This post originally appeared on the Accion website. The Global Findex is crucial for pushing forward financial inclusion. With data from 150 countries, we can see progress toward bringing financial tools to everyone and even understand how people are using those tools. The driving force behind this research is Leora Klapper, Lead Economist in the Finance and Private Sector Research Team of the Development Research Group at the World Bank Group. Because of her exceptional leadership in advancing financial inclusion, Accion has chosen Leora as their Edward W. Claugus Award honoree. We took the opportunity to ask her thoughts on the Global Findex, the financial inclusion gender gap, and how we can continue to build a world where all people have financial services that make a meaningful impact in their lives. 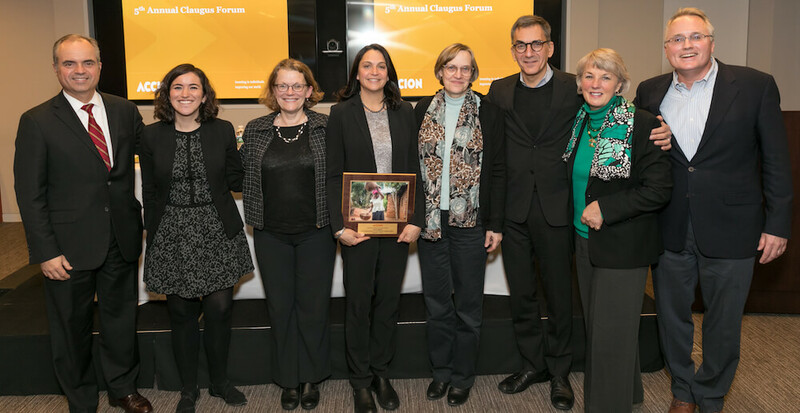 CFI participated in a panel discussion with Klapper (pictured above) after the bestowing of the Claugus Award. CFI’s Beth Rhyne and Deb Drake participated, along with the Economist Intelligence Unit’s Monica Ballesteros Aria. Q: Accion has selected you for our Claugus Award based on your contributions to driving financial inclusion. Are there moments of your career that make you particularly proud of the work you’ve done in financial inclusion? A: I’m excited that the Global Findex has become a valued resource in the world of financial inclusion research and policy. Several places wrote previews before we released the latest Findex round, and then followed up with reviews after the data was published. People were treating the Findex like a Beyonce album drop. It was a little crazy but very encouraging. But seriously, we’re grateful that the Bill & Melinda Gates Foundation had the vision to fund the Findex data collection and appreciate our great partnership with Gallup. It’s been a privilege to contribute to the policy dialogue with the credibility of data backing us up. Reporting to policymakers the number of millions of unbanked women receiving their welfare payments in cash or the number of government workers with bank accounts, still receiving their wages in cash, is a game-changer. I’m proud that we moved the needle in highlighting the importance of collecting data not only on household heads, usually men, but on every adult member of the household — including women, young adults, and older adults. I’ve been on my soapbox since the first round of Findex data was published ranting about the importance for women to have their own account. I hope shining light on the gender gap in the use of financial services has helped more women get a safe place to keep their money. Q: In your time at the World Bank, how have you seen financial inclusion’s role in eliminating poverty evolve? A: When I started working at the World Bank, the overall thinking in development was that countries should generally focus on getting the macro picture “right” — through privatization, deregulation, and so on — so growth would take off and poverty would drop. Now there’s a greater focus on individuals and more recognition that financial services can help people better meet their goals in health, education, entrepreneurship, and so on, thereby driving development outcomes overall. Each year, we get more Findex queries from a broader range of World Bank colleagues who see financial inclusion as relevant to what they do. The focus of financial inclusion research has also shifted during my time at the World Bank. At first, it was almost exclusively about microcredit. Then new data sources, including financial diaries, showed us that even poor families that have small, unpredictable incomes lead complicated financial lives — but they often use informal, expensive, and riskier financial products. Now there are tons of studies on savings, payments, agricultural insurance, financial consumer protections, and more. It’s hard to keep up with all the new papers — which is a good problem to have. Q: What part of the most recent Findex results do you think has resonated most strongly with the industry and why? A: I think our data on digital financial services has drawn the most attention. One of the great things about financial inclusion is that it appeals to so many constituencies. We attract the development crowd, of course, but also the tech geeks, big data aficionados, policy technocrats, women’s empowerment champions, financial industry titans, bitcoin zealots, blockchain evangelists, and many others. Our data is routinely cited in both the major international media and regional media across the developing world. People are looking at progress and setbacks in neighboring countries and seeing how they can apply lessons to their own countries. Q: If we could do one thing to promote usage of financial accounts, what would it be? A: Can I cheat and mention two? First, I would love to see wider digital payment acceptance among merchants in emerging countries. Second, the development advocate in me yearns for cheaper ways to send remittances. Every year migrants send home more money to the developing world than governments spend in aid. That money provides vital support for people in poor countries. But remittances are still crazily expensive: On average, they cost just beneath 7 percent of the amount being sent, and banks charge the most on average, at more than 10 percent. Our colleagues estimate that reducing costs by 5 percentage points could save up to $16 billion annually — money that could go to development needs. Q: As we look beyond access to see whether financial tools are being used and improving people’s lives, what are some of the most important metrics to look at? A: I’m quite excited about the research showing the impact of having an account on household spending decisions — like studies in Africa and Asia showing that offering woman an account leads to greater spending on healthcare, education, and nutritious food. In Bangladesh, we’re finding that paying women into an account increases their savings, decreases their impulse spending, and gives them greater say on how household income is spent. In other words, having an account gives a woman greater privacy, security, and control over her money — which gives her a more comfortable seat at the table. The link between financial inclusion and productivity has been on my mind lately. We’re starting new work with tea pluckers and asking the question: If a woman gets paid directly into her own account, and sees the full payoff of her labor, will she work harder? Or be more productive? Will she be less likely to quit her job? I think this is an exciting new avenue of research to motivate the private sector to partner in our efforts to expand financial inclusion and digital payments. If a woman gets paid directly into her own account, and sees the full payoff of her labor, will she work harder? Or be more productive? A lot of financial inclusion analysts have raised the importance of financial health and how to measure it. I’m not yet sure what the best metrics are, but lots of smart people at IPA JPAL and elsewhere are thinking about that, and the results should be exciting. Q: The latest data shows that the gender gap in financial inclusion persists. In your research, have you seen any particularly effective strategies for closing this gap? A: India’s experience shows that policies can help close the gender gap. Three years ago, men were 20 percentage points more likely than women to have an account. Today, the gender gap has fallen to 6 percentage points, thanks to a government push to expand account ownership by drawing on biometric identification. That progress comes with a lot of caveats. Nearly half of accounts in India are dormant, and women are more likely than men to have a dormant account. But at least they have greater access to this basic financial service — and the potential is huge. Q: As mobile phone usage continues to grow, how do we ensure technology can live up to its promise for driving financial inclusion? A: Mobile phones can be tools for delivering fair, affordable financial services to the poor, and they can also be tools for defrauding the poor. The difference between the two has a lot to do with consumer protections. Recent CGAP research on digital credit suggests that weak oversight has allowed companies to push predatory loans through mobile phones, leading to defaults and indebtedness. Policymakers need to make sure that regulations keep pace with digital innovation to ensure things like that don’t happen. Otherwise, people will distrust digital financial services, and development opportunities will be lost. We also need to make sure that women have access to the technology and aren’t being left behind at the starting gate. As we increasingly leverage mobile phones and the internet to deliver financial services, we need to watch the 10 percentage point gender gap in mobile phone ownership across developing countries, and much larger in some regions. Q: How will we know when financial inclusion has succeeded? A: Ultimately, I’d like to see a situation where everyone has access to affordable and transparent financial services which they can use to meet their needs — whether for saving, investing, moving money, or hedging against risk. But I’m not sure if we’ll ever get to a situation where we can just declare victory and go home. Development progress is always uneven, and there will also be groups of people excluded from appropriate financial services. I think we’ll be working on financial inclusion for a while.